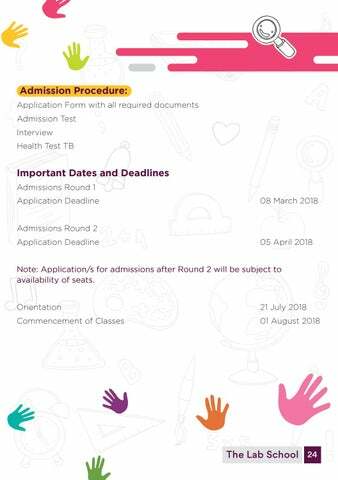 We prepare students for life; through independent learning all students will achieve academic excellence and the necessary critical thinking and problem solving skills to be successful in the new global society. Beliefs We believe that if students canâ&#x20AC;&#x2122;t learn the way we teach them, we must teach them the way they learn. We believe that students learn in different ways and prefer to learn at their own pace. We believe that each child is a unique individual who needs a secure, caring, and stimulating atmosphere in which to grow and mature emotionally, intellectually, physically, and socially. It is our desire to help students meet their potential in these areas by providing an environment that is safe, supports risk-taking, and invites a sharing of ideas. There are three elements that we believe are conducive to establishing such an environment, (1) the teacher acting as a facilitator, (2) allowing the childâ&#x20AC;&#x2122;s natural curiosity to direct his/her learning, and (3) promoting respect for all things and all people. We believe that a teacherâ&#x20AC;&#x2122;s role is to guide students and provide access to information rather than acting as the primary source of information. For students to construct knowledge, they need the opportunity to discover knowledge for themselves and practice skills in authentic situations. We believe that it is important for students to have the opportunity to study things that are meaningful and relevant to their life and interests. Developing a curriculum around student learning styles and interests fosters intrinsic motivation and stimulates the passion to learn. When students have ownership in the curriculum, they are motivated to work hard and master the skills necessary to reach their goals. 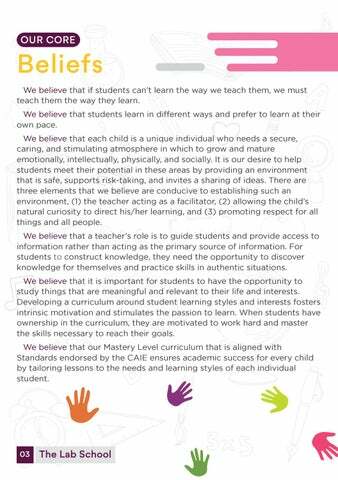 We believe that our Mastery Level curriculum that is aligned with Standards endorsed by the CAIE ensures academic success for every child by tailoring lessons to the needs and learning styles of each individual student. Each student/facilitator will create a Personalized Learning Plan (PLP) that focuses on his/her strengths and weaknesses in addition to identifying extra support in needed areas of improvement. The strength of our School is that it moves students beyond traditional classroom instruction and gives them hands-on, project based, authentic learning experiences that engage and ignite their young minds. We believe that our School will give our students the skills, knowledge, and passion for learning that they will need to excel in high school, college, and their future careers. 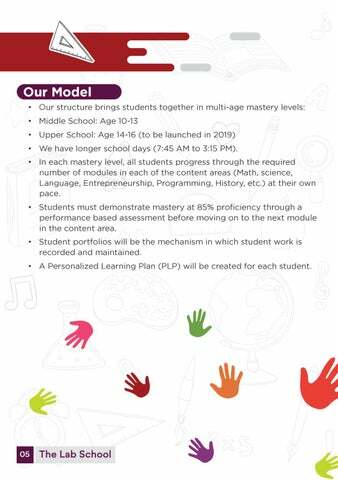 Our Model • Our structure brings students together in multi-age mastery levels: • Middle School: Age 10-13 • Upper School: Age 14-16 (to be launched in 2019) • We have longer school days (7:45 AM to 3:15 PM). 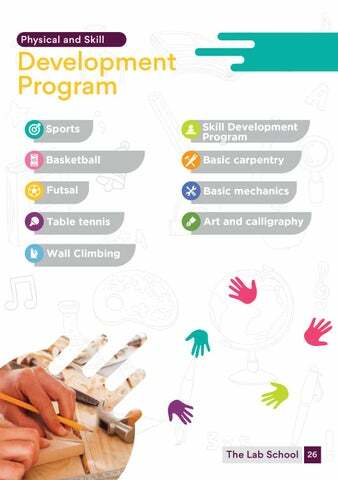 • In each mastery level, all students progress through the required number of modules in each of the content areas (Math, science, Language, Entrepreneurship, Programming, History, etc.) at their own pace. • Students must demonstrate mastery at 85% proficiency through a performance based assessment before moving on to the next module in the content area. • Student portfolios will be the mechanism in which student work is recorded and maintained. 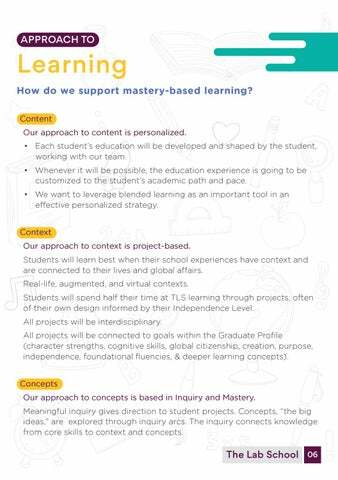 • A Personalized Learning Plan (PLP) will be created for each student. Learning How do we support mastery-based learning? Content Our approach to content is personalized. 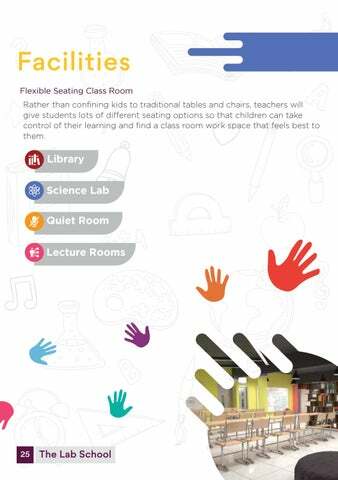 • Each student’s education will be developed and shaped by the student, working with our team. • Whenever it will be possible, the education experience is going to be customized to the student’s academic path and pace. • We want to leverage blended learning as an important tool in an effective personalized strategy. Context Our approach to context is project-based. Students will learn best when their school experiences have context and are connected to their lives and global affairs. Real-life, augmented, and virtual contexts. 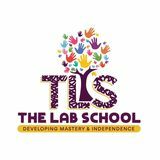 Students will spend half their time at TLS learning through projects, often of their own design informed by their Independence Level. All projects will be interdisciplinary. 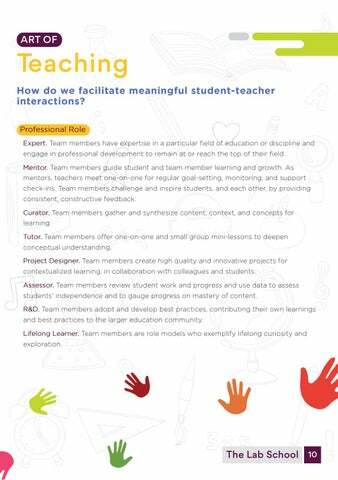 All projects will be connected to goals within the Graduate Profile (character strengths, cognitive skills, global citizenship, creation, purpose, independence, foundational fluencies, & deeper learning concepts). Concepts Our approach to concepts is based in Inquiry and Mastery. Meaningful inquiry gives direction to student projects. Concepts, “the big ideas,” are explored through inquiry arcs. The inquiry connects knowledge from core skills to context and concepts. Inquiries will be geared toward solving real world problems. Students will develop the skills to create meaningful inquiries themselves. Learning and advancing through our curriculum happens when each student is going to fully master target objectives, concepts, and skills. In most schools, time spent learning is constant while the quality and level of content mastery varies. At TLS, the opposite is going to true: learning time will be variable â&#x20AC;&#x201D; but the quality and level of mastery for all students will be constant. Continuous Improvement Our approach to continuous improvement is based in Assessment and the R&D Lab. The approach to learning will be informed by diagnostic, formative, and summative assessment, goal tracking, and frequent one-on-one conferences with teachers, and review of data from online tools. 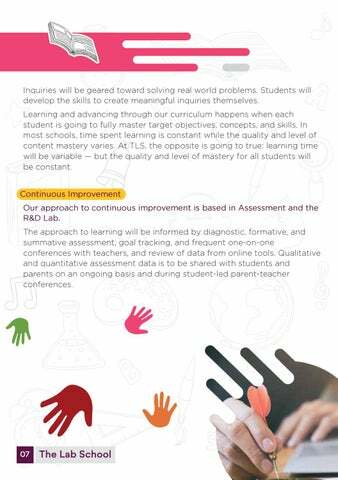 Qualitative and quantitative assessment data is to be shared with students and parents on an ongoing basis and during student-led parent-teacher conferences. Learning How is our learning experience structured? 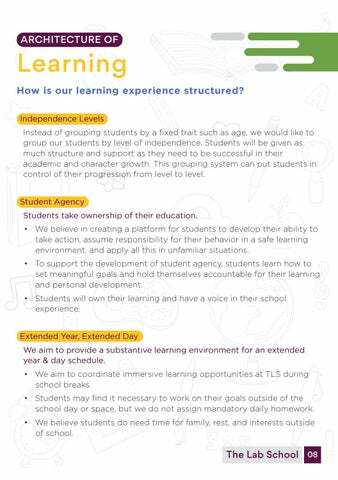 Independence Levels Instead of grouping students by a fixed trait such as age, we would like to group our students by level of independence. Students will be given as much structure and support as they need to be successful in their academic and character growth. This grouping system can put students in control of their progression from level to level. Student Agency Students take ownership of their education. 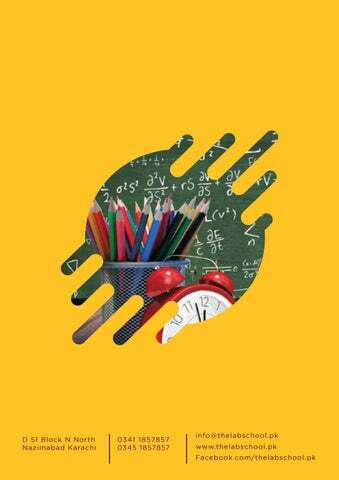 • We believe in creating a platform for students to develop their ability to take action, assume responsibility for their behavior in a safe learning environment, and apply all this in unfamiliar situations. • To support the development of student agency, students learn how to set meaningful goals and hold themselves accountable for their learning and personal development. • Students will own their learning and have a voice in their school experience. 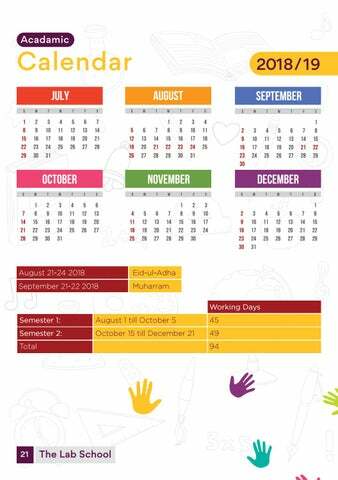 Extended Year, Extended Day We aim to provide a substantive learning environment for an extended year & day schedule. 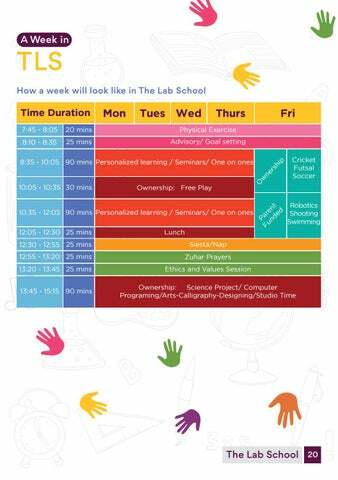 • We aim to coordinate immersive learning opportunities at TLS during school breaks. • Students may find it necessary to work on their goals outside of the school day or space, but we do not assign mandatory daily homework. • We believe students do need time for family, rest, and interests outside of school. Mixed Age / Peer Learning Students must learn from each other and teach one another. 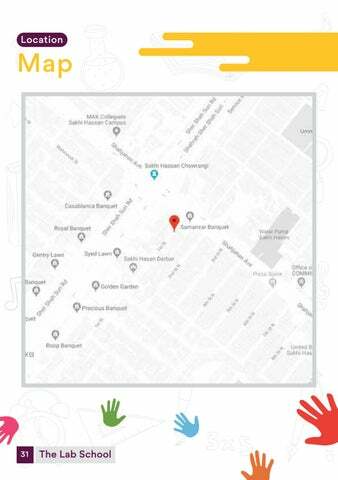 • Older students will learn how to be teachers to our younger students through regularly scheduled interactions, in which they will both give and receive feedback. • The mixed age setting will be intended to foster collaboration and impactful relationships rather than competition. Community Learning • Students will receive mentorship from community members, which will prepares them for apprenticeships and internships. • Students will also learn from the community through guest speakers, field studies, and community service. 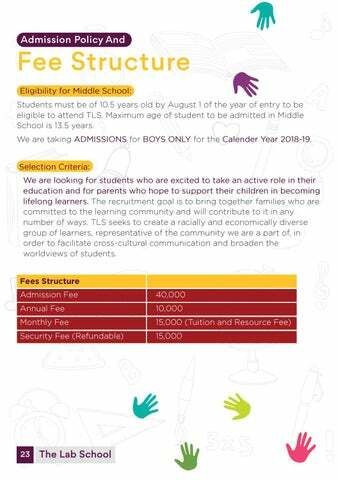 • Students will exhibit their work to a public audience multiple times throughout the year both to give back to the community and learn from their feedback and expertise. 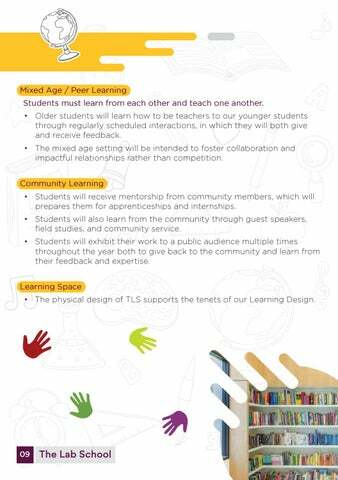 Learning Space • The physical design of TLS supports the tenets of our Learning Design. Teaching How do we facilitate meaningful student-teacher interactions? Professional Role Expert. Team members have expertise in a particular field of education or discipline and engage in professional development to remain at or reach the top of their field. Mentor. Team members guide student and team member learning and growth. As mentors, teachers meet one-on-one for regular goal-setting, monitoring, and support check-ins. Team members challenge and inspire students, and each other, by providing consistent, constructive feedback. Curator. Team members gather and synthesize content, context, and concepts for learning. Tutor. Team members offer one-on-one and small group mini-lessons to deepen conceptual understanding. Project Designer. Team members create high quality and innovative projects for contextualized learning, in collaboration with colleagues and students. Assessor. Team members review student work and progress and use data to assess studentsâ&#x20AC;&#x2122; independence and to gauge progress on mastery of content. R&D. Team members adopt and develop best practices, contributing their own learnings and best practices to the larger education community. Lifelong Learner. Team members are role models who exemplify lifelong curiosity and exploration. 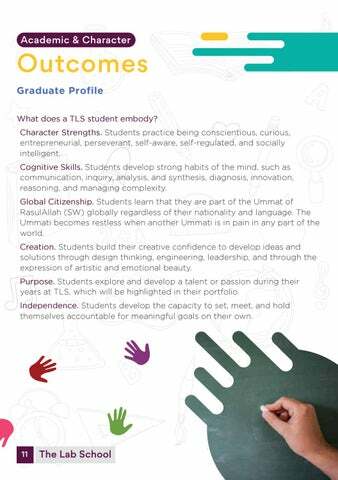 Outcomes Graduate Profile What does a TLS student embody? Character Strengths. Students practice being conscientious, curious, entrepreneurial, perseverant, self-aware, self-regulated, and socially intelligent. Cognitive Skills. Students develop strong habits of the mind, such as communication, inquiry, analysis, and synthesis, diagnosis, innovation, reasoning, and managing complexity. Global Citizenship. Students learn that they are part of the Ummat of RasulAllah (SW) globally regardless of their nationality and language. The Ummati becomes restless when another Ummati is in pain in any part of the world. Creation. Students build their creative confidence to develop ideas and solutions through design thinking, engineering, leadership, and through the expression of artistic and emotional beauty. Purpose. 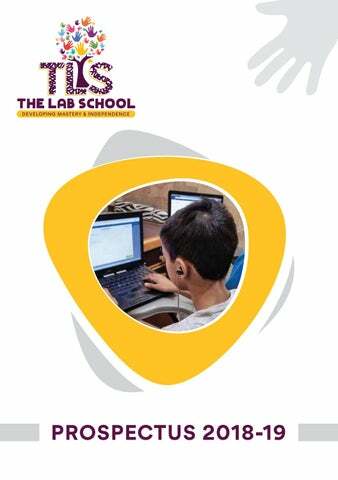 Students explore and develop a talent or passion during their years at TLS, which will be highlighted in their portfolio. Independence. Students develop the capacity to set, meet, and hold themselves accountable for meaningful goals on their own. English Language Arts Middle School Level 1: first year In Middle School, students will learn how to read for deeper meaning through collaborative discussion of a wide range of texts. Students may begin to understand themes and main ideas and will be able to identify different genres and structures. They will practice asking and answering questions to facilitate understanding and learn to support their arguments with evidence from the text. In addition, students will work on individualized term-long projects to develop their writing craft. They will learn style, organization, and content. Emphasis will be on continual revision and peer and mentor feedback not only fosters a growth mindset, but provides an application-based avenue for students to learn grammar, punctuation, and spelling. Middle School Level 2: Second and Third Year In Middle School, students will focus on how to: • Cite textual evidence to support inferences, conclusions, predictions, and generalizations. • Identify the theme or central idea of the text. • Explain how literary elements and devices contribute to the theme. • Provide objective summary of text distinguishing between objective details and subjective opinions. • Describe how characters respond or change as the plot moves toward a resolution. • Identify the stages of plot, including exposition, rising action, climax, falling action, and resolution. • Determine the meaning of the words and phrases as they are used in a text, including figurative and connotative meanings. • Analyze the impact of a specific word choice on meaning and tone. • Explain how an author develops the point of view of the narrator in a text. Computer Programming In Middle School, students will work toward personalized goals based on Tynker and Khan Academy. They will learn programming basics, build robots, and eventually progress to creating interactive webpages using jQuery. Game-based, self-paced tools will foster a passion for problem-solving in our students and build creative confidence. In Middle and Upper School, students will develop solutions using their knowledge of programming. They will definitely set goals for personalized projects and use computing to strengthen their skills in inquiry, analysis, synthesis, diagnosis, innovation, reasoning, and managing complexity. Parent-Teacher-Student Conferences Our parent-teacher conferences are student-led. There are three conferences each year. The purpose of these student-led conferences is to discuss individual students' academic and social development. Portfolios While at TLS, students build a portfolio of work that displays mastery across academic and non-academic domains, from core skills to global citizenship, sciences, arts, and beyond. Term Exhibitions At the end of each term, all students present their work to an audience of family and friends. This occurs four times each year. Students use these Term Exhibitions as an opportunity to share across Levels, give back to the community, and learn from others' feedback and expertise. The Exhibitions also provide a meaningful way for students to practice public speaking and presentation skills. 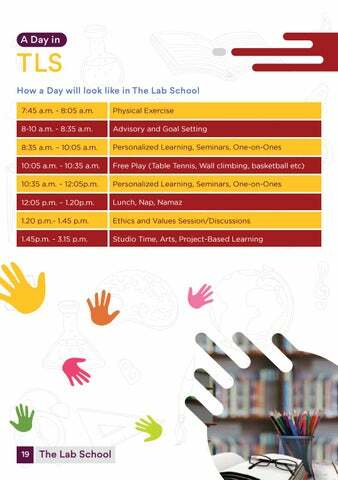 TLS How a Day will look like in The Lab School 7:45 a.m. - 8:05 a.m.
8-10 a.m. - 8:35 a.m.
8:35 a.m. – 10:05 a.m.
Facilities Flexible Seating Class Room Rather than confining kids to traditional tables and chairs, teachers will give students lots of different seating options so that children can take control of their learning and find a class room work space that feels best to them.